Ginger tea originated in China but now it has traveled places and has emerged as one of the most favorite drinks mainly because of its fantastic aroma and flavor. Ginger is versatile in its uses, it is used fresh and dry, powdered etc. but ginger tea sees the implementation of the flavors of ginger in the most perfect form. Everybody is aware of the medicinal value of ginger tea, it also enriches you with health and it is a very tasty drink too. It has been used by Chinese for over 2,500 years for various issues like sore throat, sinus pain, nasal congestion etc. Ginger is enriched with copper, magnesium, potassium, calcium and zinc. Apart from that it contains vitamin B, C as well as D.
Treats Nausea and vomiting: Ginger has the benefits of reducing nausea and vomiting. Have ginger tea in case you get nauseate especially post a surgery or due to motion sickness and even sea sickness. It is also great for the feeling of vomiting sensation post chemotherapy. Prevents cold and flu: Ginger has been used for treating cold and flu since ages. Ginger helps in the loosening up phlegm. This makes it easier to recover from cold or congestion as it eases out the breathing. It also helps in easing out allergies as well as constant sneezing due to hay fever. Helps in relieving stress: Ginger tea is proved to be an excellent stress reliever. Primarily because of its excellent aroma that instantly soothes your senses, it relaxes the brain and brings down the emotional baggage in the mind. Ginger comprises of active ingredients like shogoals and gingerols that cleanses the toxins from our body which is produced during stress. Asthma patient can also benefit the most from ginger tea as they are the prey to these issues most often. Appetite enhancer: Ginger tea is known to be a great appetite enhancer. Ginger tea can also be consumed after meals to aid in digestion. Decreases menstrual pain: Ginger tea should be had regularly prior to your periods as well as through your periods as it helps in reducing the menstrual pain. Relieves headache: Ginger tea helps to decrease the headache as ginger has the ability to inhibit prostaglandin synthesis that aids in relieving pain as well as inflammation in blood vessel hence providing relief from headaches. Aids blood flow: Consuming a cup of ginger tea helps to activate the mineral acid which enhances the circulation of blood throughout the body. This results in better blood flow to various parts of the body. Acts against cancer: Ginger comprises of high doses of antioxidants. This helps in inducing apoptosis and it also helps in suppressing certain proteins. Studies have proved that ginger is a powerful tool against cancer. Keeps the bad cholesterol at bay: As per studies ginger tea helps in keeping the bad cholesterol at bay, along with that it boosts the good cholesterol. 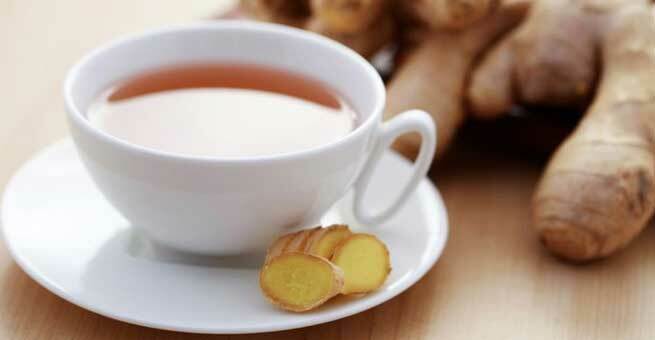 Strengthens the immunity: The antioxidants present in the ginger tea helps in improving the immunity. Consume a cup of ginger tea daily in order to decrease the potential risk of stroke through constraining the fatty acids so that it does not clog the arteries. The powerful antioxidants present in the ginger tea will help in decreasing the free radicals produced in the body. Although ginger tea is full of benefits, there are certain things that need to be kept in mind. Consumption of excess ginger tea can lead to gastric trouble as well as low blood sugar. Ginger is said to be interfering with anesthesia as a result causes bleeding as well as slow healing therefore doctors advice cutting ginger off the diet a week prior to surgery.